After four long years, Apple unveiled on Thursday a new MacBook Pro. At an event held at its headquarters, the company showed off new 13-inch and 15-inch MacBook Pro notebooks. 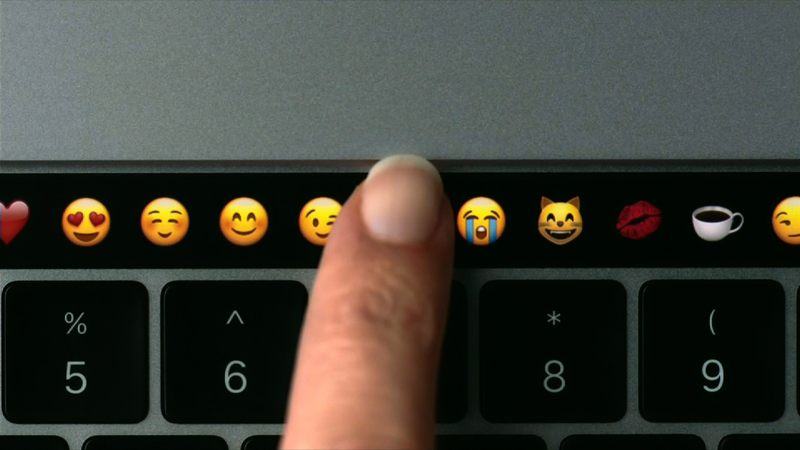 Both include a new display called the Touch Bar at the top of the keyboard. The display, positioned where the function keys used to be, allows you to control Mac apps with your fingertips. It will adjust in real time based on what software, such as Photoshop, you're using. The devices feature a trackpad double the size of its previous models. But the 13-inch MacBook Pro is 23% smaller in volume and considerably thinner than the previous version. 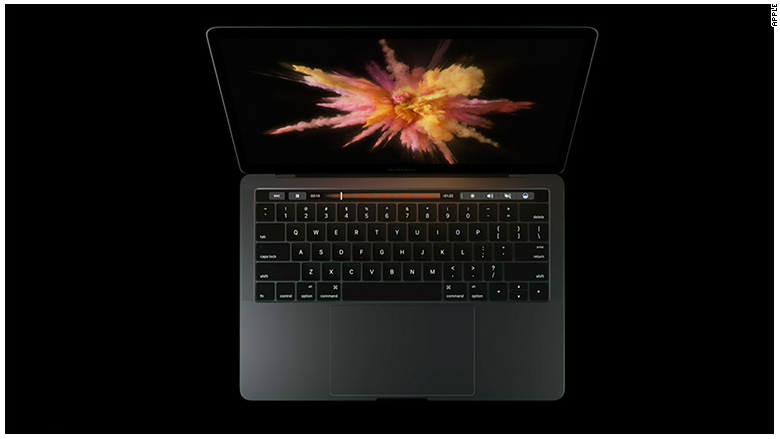 The smaller version weighs just three pounds -- the 15-inch MacBook Pro clocks in at one pound more. Touch ID is also coming to the MacBook Pro, located next to the Touch Bar. You can use it for security, like logging into your computer or switching between users, and access Apple Pay with the touch of your finger. With an Intel Core i7 processor and a new graphics card, the 15-inch MacBook Pro is more than twice as fast as the previous 15-inch model. The 13-inch model also features improved speed and performance. Apple is also making a model of the 13-inch MacBook Pro with traditional function keys and no Touch Bar. The product is meant to appeal to potential 13-inch MacBook Air buyers -- its smaller and thinner (and more affordable) laptop. The 13-inch MacBook Pro is priced at $1,799, while the 15-inch model is $2,399. 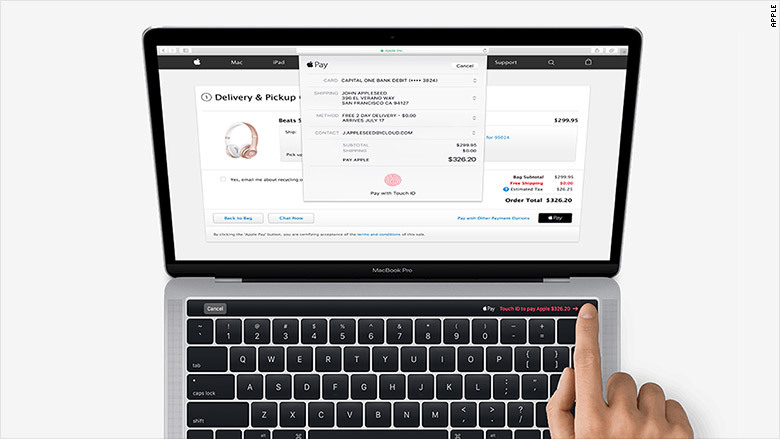 The MacBook Pro without the Touch Bar costs $1,499. The cheapest version will start shipping on Thursday, while the Touch Bar models will be available in a few weeks. The devices will also work with a new LG 5K display, which launches in December and will cost $1299. Apple (AAPL) CEO Tim Cook kicked off the event by announcing a TV app that lets you access content across other apps. A feature called "Up Next" allows you to toggle between what you're watching on your mobile device and the TV (i.e. you'll be able pick up where you left off in a movie bought on iTunes, or a TV show from HBO Now). The free app will roll out by the end of the year. A leaked photo of the MacBook Pro found in a recent Mac update. Cook added that 8,000 apps are now available on Apple TV -- 2,000 of which are games. Popular game Minecraft will be coming to the platform soon. "We believe the future of TV is apps," Cook said. However, the company didn't announce any updates coming to the iMac desktop computer. We also didn't learn more about when consumers can buy a pair of AirPods, Apple's new wireless earbuds teased at the iPhone event last month. The company said on Wednesday it is delaying the launch for an unknown amount of time. Although the iPhone remains the company's biggest moneymaker, Mac sales accounted for 12% of revenue in the third quarter of 2016. Earlier this week, Apple reported an annual sales decline for the first time since 2001. It's uncertain if Thursday's news will drum up consumer excitement and spark an uptick in sales.